Route Nambucca V-wall to the highway, return. Distance 6km- plus options to continue. Description Leisurely pedal along the riverside. Start/finish End of Wellington Drive. 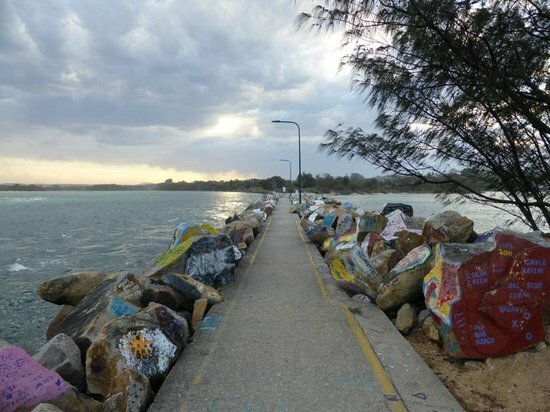 Highlights Nambucca V-wall, boardwalks, shared paths, riverside parks. • First take a detour along the V-wall, a public graffiti-art gallery along the breakwall. Head back past the carpark, then dismount and walk your bike along the narrow boardwalk. Follow shared paths along the river banks, alongside or through parks till you reach the Visitor Information Centre. The return ride from here would total about 6km. Continue under the highway to reach the Cinema andfood outlets on western side of highway. A shared path takes you further south alongside the highway for some extra distance. Or cross Riverside Drive and head north 1km along the shared path. Take a left between 2 logs and continue through to Centenary Drive. Ride on road up to the roundabout on Mann Street. Nambucca Heads is very hilly! But if you can handle some hills, and riding on-road, you can have some fun exploring the town. You’ll be rewarded with some spectacular views. Route Macksville to Newee Creek via Wirrimbi. Distance 16km loop or return ride. Description Experience the beauty of the Nambucca Valley. Take your MTB to fully appreciate the range of scenery. Start/finish Ferry Park, Macksville, on north side of the river. Highlights Riverside, and country scenery. Part on-road, part unsealed (Old Coast Road). Or go out and back the same way to stay on the tar. Head west along the river, under the railway, then north along Rodeo Drive. At about 5 km turn right at Wirrimbi Church, then after 2.5km turn right onto Sidings Road (dirt). Return the same way, or continue down Sidings Road, across the railway, then turn right into Old Coast Road. Head south a few kilometres till you meet the Pacific Highway. Take care crossing the highway, turn right, ride for a few hundred metres, then take a left into Nursery Road to cut across to the river. Follow the shared path across the footbridge, then follow the river back into town. There is a path under the bridge to take you back to Ferry Park. Route Macksville to Gumma Dock/Boulton’s Crossing, return. Distance 14km return ride along the river. Description On road, easy, scenic ride along the river, some local traffic. Go a bit further on dirt for a great swimming spot in Warrell Creek. Start/finish Macksville town centre,south eastern side of highway. Highlights A great riverside ride that is mostly flat. Head east along the south bank of the Nambucca River. At about 4km, take a side trip left into Figtree Road. Gumma Dock is a peaceful picnic area right on the river. Return the same way, or for a longer ride, continue along Gumma Road. Turn left at the signpost to Boultons Crossing. Follow this road about one kilometre (mostly dirt) to the picnic and camping area. This is a popular canoeing and swimming spot. There are numerous other popular rides enjoyed by locals in the Nambucca Valley. Many take advantage of the many unsealed roads throughout the rural countryside, or in patches of State Forest. Others will appeal to experienced road or touring cyclists. Ride on-road between the main towns of Nambucca Heads, Macksville and Bowraville (40+km). Keen cyclists might enjoy the challenge of the big ride out to the Pub With No Beer at Taylors Arm (52km return from Macksville). Talk to Chris at CK Cycles & Skate in Macksville (behind BCU) for details and suggestions.